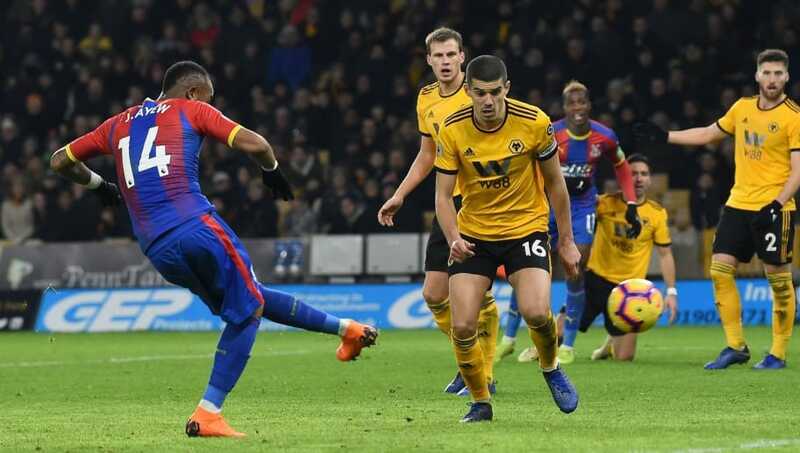 Wolves failed to register back-to-back wins in the Premier League as Crystal Palace eased to a 2-0 win at Molineux. The hosts failed to get going as the Eagles controlled the game from the first minute and they eventually translated their superiority on to the scoreboard with two late goals. Jordan Ayew's breakthrough goal came in the 82nd minute, as the Ghanaian coolly controlled Patrick van Aanholt's shot before guiding a low effort past Rui Patricio in the home goal. The points were then sealed when Ryan Bennett felled Wilfried Zaha in injury time, allowing Luka Milivojevic to wrap things up from the penalty spot. The match itself was devoid of real quality as neither team showed the know how or ability to break down their opposition. ​Crystal Palace are tied in the league for having played in nine matches without scoring, more than anyone else, and it is clear to see why. They are defensively resolute and work hard off the ball, but when Zaha isn't on form they struggle to find ways of creating opportunities. Wolves, meanwhile, tried hard in the second half to make things happen but failed to gain any real momentum. They have struggled at home in recent games compared to their away form as teams limit their counter attacking ability. It is likely the hectic Christmas period played a part determining the quality on show as neither team appeared sharp in the final third. The key talking point for Wolves was defender Willy Boly's miss just before half time. The French centre-back was instrumental in their comeback last week away against Tottenham where he scored a great contested header from a corner. He had a carbon copy opportunity in this game only this time he got it all wrong. 37: A big let off!! Boly misses a free header from six-yards out and then Doherty heads over from inside the six yard box! Boly was free six yards out but miscued his header so badly it found it's way to Matt Doherty who was only able to react in time to send the effort over the crossbar. Starting XI : Patricio (6) ; Jonny (6) , Boly (7) , Coady (8) , Bennett (7) , Doherty (7) ; Saiss (6) , Moutinho (5) ; Cavaliero (6) , Jimenez (5) , Costa (6). Substitutes: Gibbs-White (5), Neves (6), Traore (6). The club captain was great for the home team. He showed his leadership qualities and made sure Wolves were never in too much trouble for much of the game. He seemed to win every challenge he was involved in and was positionally brilliant. In what was a disappointing result for Wolves, Coady was one of the few who could leave the field with his head held high. Result aside, can someone make a compilation of conor Coady's passes tonight please. The kid is like the love child of Gerrard and Carragher. Brilliant vision and accuracy. The Mexican striker just had one of those games. The on-loan Benfica star has been a staple of the Wolves team this season but this was not one of his finest games. He undoubtedly tried his best, but ultimately lacked quality and was perhaps a little jaded from his heavy workload. He was not the only one who struggled in the forward areas but Jimenez had the best of the opportunities available. Multiple times it was his poor pass or sliced finished which ended a Wolves attack. What an important goal Ayew's might be. Crystal Palace have now scored more goals in their last three away games than they have done all season at home and it will be their away form which keeps them out of danger. In many ways it was the perfect away performance. Ayew's goal came after a spell of pressure from the Eagles and they seemed to get the bit of luck they were looking for. There were a number of goal mouth scrambles just before the goal but this time a Palace player found himself with enough space to find a way past Rui Patricio. Starting XI : Guaita (7); Wan-Bissaka (7); Tomkins (6), Sakho (7), Van Aanholt (8); Kouyate (5), Milivojevic (7), McArthur (7); Townsend (6), Ayew (8), Zaha (7). Despite Ayew scoring the winner, it was Van Aanholt who stood out. The defender did what was asked from him defensively all night and Wolves winger Ivan Cavaleiro never had a moments joy. He was also excellent going forward. If not for one or two poor passes from his teammates he would have created more. It was also his effort which found it's way to Ayew providing him with a maybe undeserved or fortunate assist. The central midfielder was poor today. No one in a Palace shirt played badly but he was by far the poorest. The Senegalese midfielder was sloppy all night and looked tired. His poor play broke up more attacks for his own team than he managed to stop for the opposition. 90+4 The skipper smashes it into the top corner! Wolves stay in 9th place for now but slip further behind the top seven. They face Liverpool at home next in the FA Cup before facing Manchester City away in the league. Crystal Palace, meanwhile, face Grimsby in the FA Cup before facing Watford at home in Premier League action.